FA07 is a n X-ray Film Dryer that Process by adopting new techniques, has a beautiful outside and a reasonable design, and has the functions of displaying the digitals of the control temperature, so it is easy to operate. Process by adopting new techniques, has a beautiful outside and a reasonable design, and has the functions of displaying the digitals of the control temperature, so it is easy to operate. 1.The X-ray film thermostatic drying cabinet is suitable for the units such as the hospital and the institution of higher education to dry the X-ray films. 2.Equipped with digital-displayed thermostat and timer, this machine can be easily to set the temperature and time according to the requirements. 3.With casters under it, the chamber is easy to be moved. 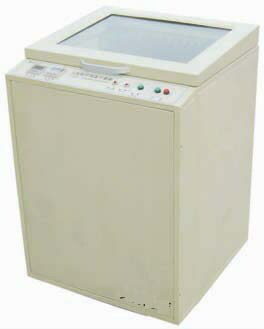 It is ideal equipment for drying films. 1. Drying temperature: from domestic temperature to 60, constant adjustment. 3. Control time: manual set, 0-100 minutes. 4. Effective drying volume: 590×375×510mm. 6. Power consumption: drying by heating up ≤1.8KW, drying under room temperature ≤200W .